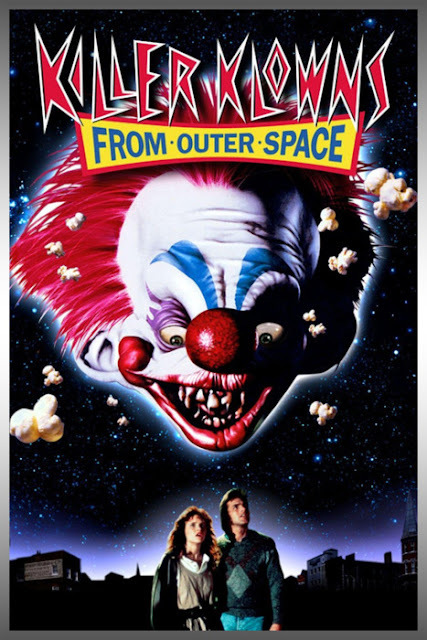 Chrichton's World: Review Killer Klowns from Outer Space (1988): Clearly a lot of love and creativity went into this production which is something I rarely seen these days. Review Killer Klowns from Outer Space (1988): Clearly a lot of love and creativity went into this production which is something I rarely seen these days. How can you go wrong with a title like this? Aliens who look like and act like clowns with one twist. They are here to collect humans to consume or more precisely drink their blood. All this might sound really dark and sinister. But it is the exact opposite. The movie simply is fun. Not the kind that will make you laugh out loud all the time. But where it is obvious that all the events can't be taken seriously even if the actors do play it straight faced. Certain themes make an appeal to nostalgia, like the circus and carnival attributes and food like cotton candy and popcorn. You almost can smell it. And that of course is it's biggest charm. The main stars are the alien clowns. They look very creepy especially when they are walking very slow. In the same vein as the old school zombies do. Slowly but surely they will get you. Even when the clowns are menacing a lot of cuteness factors are added to make them appear less evil. Killer Klowns might not be truly scary. It it is filled with scenes of genuine creepiness. Clearly a lot of love and creativity went into this production which is something I rarely seen these days. A must watch!